In this Prayer to Saint Peter Claver, we ask this great missionary to the Americas to inspire in us a similar missionary spirit, keeping always in mind that spiritual ills are more deadly than physical ills. Dear Saint of our modern times, you were permeated with compassion for the oppressed, for human beings sold as slaves and treated as expendable beasts. While alleviating their natural ills, you also took away their spiritual ills, and taught them the surpassing knowledge of Christ. Peter Claver, worthy son of St. Ignatius, pray for us. Peter Claver, priest of God and servant to the Church,…pray for us. Peter Claver, generous imitator of St. Francis Xavier,…pray for us. Peter Claver, who exchanged the riches of this world for evangelical poverty,…pray for us. Peter Claver, apostle to blacks brought to the New World,…pray for us. Peter Claver, who by vow made thyself slave of the slaves, …pray for us. Peter Claver, refuge of the miserable, pray for us. Peter Claver, great wonder worker,…pray for us. Peter Claver, who cured the sick and consoled the afflicted, pray for us. Peter Claver, Liberator of slaves unto the freedom of the children of God,…pray for us. Peter Claver, model of evangelical industry, pray for us. Peter Claver, tender father of the poor and orphans, pray for us. Peter Claver, who made thyself all things to all in order to gain them for Christ, .. pray for us. Peter Claver, who in all trials of this life didst put thy trust in God, pray for us. Peter Claver, who wished to be accounted as nothing and forgotten by men, pray for us. Peter Claver, who sought no other wisdom but the folly of the Cross, pray for us. Peter Claver, shining example of humility and self renunciation, pray for us. Peter Claver, perfect example of obedience and subjection, pray for us. Peter Claver, intrepid apostle, powerful in word and deed, pray for us. Peter Claver, martyr for Christ for the salvation of souls, pray for us. Peter Claver, zealous lover of the most Holy Sacrament of the Eucharist, pray for us. Peter Claver, imitator of the suffering Savior, pray for us. Peter Claver, powerful protector of all who invoke thee, pray for us. 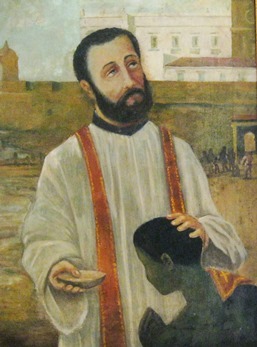 Lord, for love of you, St. Peter Claver became the faithful servant of slaves. Help us to see the true dignity of the human family, all children of one father and to spend ourselves for their salvation. We ask this through Our Lord Jesus Christ, your Son, who lives and reigns with you and the Holy Spirit, one God for ever and ever. Amen. For updates on the 80th Anniversary Celebration of St Peter Claver click here. ← Are You A SPC Volunteer?